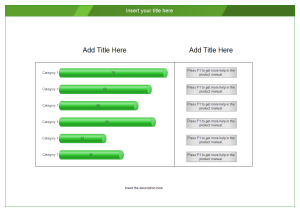 Creating bar chart with free templates and examples. Bar chart has never been easier. A bar chart or bar graph is a chart with rectangular bars with lengths proportional to the values that they represent. The first bar chart appeared in the book "The Commercial and Political Atlas" in 1786, by William Playfair who was a pioneer in the use of graphical displays and wrote extensively about them. 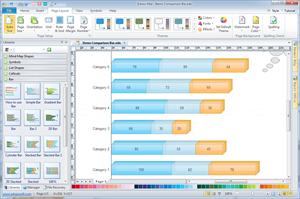 Bar charts provide a visual presentation of categorical data and are also very useful for recording discrete data. 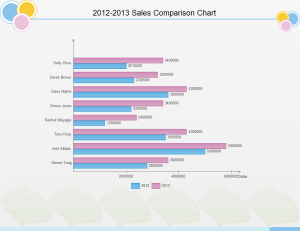 Bar graphs can also be used for more complex comparisons of data with grouped bar charts and stacked bar charts. In a grouped bar chart, for each categorical group there are two or more bars. These bars are color-coded to represent a particular grouping. For the most part, bar charts and column charts are really the same thing. Both provide a graphical representation of data using "bars" or "columns" to compare items. These types of charts have different names because of the way they pictorially present the data. In short, a bar chart represents the data using horizontal objects and a column chart uses vertical objects. Edraw provides a collection of tools to create professional-quality simple bar, stacked bar and 100% stacked bar. You can use the templates directly rather than hand drawing. By clicking the floating button on the bar, you can input a file with your data, and the software will automatically generate a new bar chart for you, which is very fast and convenient. You can also export it to PDF or a variety of other graphic formats just as easily. Edraw software offers you plenty of special bar shapes including simple bar, gradient bar, bar, 3D bar, cylinder bar, stacked bar, 3D stacked bar, stacked cylinder, 100% stacked bar, 3D 100% stacked bar, 100% stacked, single bar.